Since 1989 the NSW Sea Kayak Club has published a quarterly magazine by and for club members. Many of the published articles can be found on this website. In 2012 the magazine was renamed SALT. If you would like to contribute or advertise, please contact the editor through the club website. Safety Kit: Laser Flares The Future in Marine Signalling? These days it seems that the sea kayaker’s Personal Flotation Device (PFD) is rapidly becoming a repository for so much safety gear that the word ‘flotation’ should surely be replaced by something else. Depending on location, a well-prepared sea kayaker carries at a minimum a Personal Locator Beacon (PLB, similar to an EPIRB, but smaller and able to be fitted into a PFD pocket), a hand-held marine VHF radio, a mobile phone (appropriately waterproofed), and pyrotechnic distress flares, as well as a strobe light, signal mirror and perhaps sea marker dye. It’s little wonder that as a result there’s not very much ‘F’ in ‘PFD’ any more. So anything we can do to reduce the bulk and weight of equipment carried in the PFD must be a good thing. Among the most bulky items are distress flares. Before the advent of the PLB and VHF radios, pyrotechnic distress flares used to be the only practical device available to the kayaker to summon assistance in case of emergency at sea. They are still routinely carried by many sea kayakers, mostly as a sensible precaution rather than in compliance with any regulatory requirement. The NSW Maritime Boating Handbook (2011-12) exempts canoes and kayaks from carrying the same safety equipment as boaters on open waters, including the otherwise mandatory distress flares. Regardless of whether or not they are legally required to be carried, distress flares are still an essential adjunct to use of a PLB, VHF etc. A PLB or VHF will get rescuers to the approximate location, but a visual signal of some sort is essential for attracting the attention of search and rescue aircraft or vessels to your precise location, the concept of ‘the final mile’. Simply alerting a Search and Rescue agency by PLB, EPIRB, VHF and/or DSC (Digital Selective Calling) may not be enough: the rescuers also need to be able to locate you. Rescue aircrew may not be able to see their search target even when the aircraft is virtually overhead and in good weather conditions. In white-capping seas on an overcast day or in low light, SAR crews are unlikely to be able to spot their target without some form of position marking. Distress flares, a strobe and/or sea marker dye are essential under these sorts of conditions. Other technologies for this ‘final mile’ location are still emerging, and for the time being flares are, in the eyes of official agencies, the most effective solution for pinpointing a vessel in distress. But pyrotechnics have their limitations: with burn times of around 60 seconds each, they are very short-lived, as well as being quite bulky, potentially dangerous (they are Class 1 explosives) and needing to be replaced every three years. Flare and particularly hand smoke performance can also be degraded by wind and weather. Hand smokes are not much good at night or in more than 10kts of wind (the smoke will be dissipated too quickly to be an effective visual signal). Operating smoke and flares in rough conditions is both a great challenge and potential hazard to the operator. One yachting forum has an extremely long thread discussing accidents with hand held flares and the need to use welding gloves when operating them! Enter the laser flare: a small, safe and long-lasting alternative to the hand-held pyrotechnic red distress flare. Greatland Laser make several laser flare products, but the Rescue Laser Light is perhaps of most interest to the kayaker given its exceptionally small size and reliability. It is about 80mm long and 20mm in diameter and weighs about 100g. It is waterproof to 24m and of very robust aluminium construction, but it does not float. The Rescue Laser Light is available in both red and green laser lights. To ensure it will be seen by the target, the Rescue Laser Light projects a wide flat beam of laser light, rather than the concentrated point of light produced by a conventional laser pointer. Accurate use, however, requires two hands, one hand to act as sight by bracketing the target (e.g. a helicopter or vessel) with two fingers, and the other to hold and aim the flare. You will see the line of the beam on your fingers and it is a simple matter of slowly scanning the beam of light up and down so it crosses the target. The recipient of the signal will see bright flashes, as the beam crosses their line of sight, rather than a continuous bright light. The effect is similar to that of a signal mirror in sunlight. Except that it works in the dark as well as daytime. But apart from its very small size and corrosion-resistance, the greatest advantage of this device is that provides 40 hours continuous signalling on one battery. That’s a whole lot more than the 2-4 minutes of signalling available from the ‘2 smokes, 2 hand held distress flares’ pack. The manufacturer claims that, under ideal conditions, the laser flare will be visible from 32km at night and 5km in daylight. But how good is the Rescue Laser Light in practice? A red Rescue Laser Light was tested during the search and rescue exercise held at the 2012 Rock ‘n’ Roll, during which a group of paddlers used a range of signalling devices to attract the attention of a real live rescue helicopter. Julian Holder, the pilot of Rescue 26, the NSW Ambulance Service rescue helicopter which participated in the exercise, has provided a detailed write up of the various signalling methods tested. His report is available on the club website. It should be noted that the SAR exercise was conducted under very benign conditions with an almost flat sea and no wind to speak of. It would have been a different story trying to use the Rescue Laser Light effectively in rough conditions, as ideally you need to use both hands for most accuracy. One-handed operation is possible, but would probably be less effective. Two-handed operation is not impossible if you’re rafted up, a factor to consider. But a laser flare is undoubtedly a lot easier and less dangerous than using a conventional pyrotechnic distress flare. It is worth noting that not only is the Rescue Laser Light useful as a distress signal, it is also useful as a search tool. The laser beam will pick up reflective tape at great distances, useful for spotting a paddler or boat in the water at night or finding your tent in the dark (if it has reflective guylines), or even for attracting the attention of your mates in a non-emergency situation. Even more recently I’ve become aware of a different style of laser distress flare product known as the Odeoflare, so named because it is an omni-directional electro-optical device. This device is produced by OdeoFlare in UK. The Odeoflare is a bulkier and heavier device (265mm x 50mm and 330gm in weight, about the same as a pyrotechnic hand flare), but claims 5 hours continuous operation from 3 x L91 (AA size) lithium batteries. This device is waterproof and importantly it floats. Although I haven’t yet laid my hands on this device, its greater advantage seems to be that it will be visible from any direction and only requires one hand to operate, that is, you just need to hold it up like a conventional pyrotechnic hand flare rather than aim it at a rescuer. Both the Odeoflare and the Rescue Laser Light are classed as Type 3R laser products, which means they are not dangerous to the eye with brief accidental exposure, although it is obviously not recommended to look at any bright light source. Greatland Laser claims that their Rescue Laser can safely be used to signal an aircraft for help when in distress, and that they will not cause eye injury or flash blindness to aircrew. Our practical exercise with Rescue 26 bore out this claim. Aircrew viewing the rescue laser had no complaint or damage with either naked eye or through night vision goggles. By their very nature laser flares, just like hand flares, can only be operated from a kayak at sea level. The signal may not be visible to a rescuer at the same level a long distance away i.e. it will be below their horizon. In these circumstances, a pen flare, or a parachute or rocket flare could be a better option. Secondly, a laser flare may not yet be generally recognised as a distress signal to the ‘man in the street’. This is perhaps a secondary consideration as a laser flare is designed as a location aid rather than a primary alerting device. But there is evidence that people have responded to the OdeoFlare in the same way as they would a conventional pyrotechnic flare: from a distance the OdeoFlare appears the same, a bright glowing light. In a nutshell, the Rescue Laser Flare is not a prohibited import, but is a prohibited weapon in most Australian jurisdictions and may require a permit. The OdeoFlare, by contrast, is legal; it is neither a prohibited weapon nor a prohibited import. By way of background, in Australia laser pointers with an emission level of greater than 1mW are prohibited imports under Schedule 2 of the Customs (Prohibited Imports) Regulation 1956, unless approved by the Minister or an authorised person. Customs Firearms Policy Section, however, confirmed to me recently that Greatland Laser products, including the Rescue Laser Light, are not controlled for the purposes of importation into Australia and therefore do not require Permission to Import. But in some, but not all, jurisdictions (both in Australia and overseas) laser pointers may be classed as prohibited weapons, including in NSW. The Rescue Laser Light is currently deemed by the NSW Police Firearms Registry to be prohibited by virtue of the fact that it falls within that definition. It is possible to apply for a permit as outlined on the NSW Police website. Before considering whether to buy such a product, I urge you to check the relevant legislation, and seek advice from the appropriate police Firearms Registry. As outlined above, the Odeoflare is legal in NSW and other States, and does not require an import permit, because it does not fall within the legislative definitions of laser pointer. Due to previous restrictions on the import of lasers, the Rescue Laser Light (and other Greatland Laser products) is currently not distributed in Australia. However, the manufacturer, Greatland Laser, is willing to ship their products to Australia in the light of the recent determination by Customs, and are currently investigating reactivating their network of distributors. Odeoflares can be mailed from the UK but without the lithium batteries which Australia Post will not deliver. The batteries can be readily purchased here in Australia. If you want to satisfy yourself about the legality of these products for import purposes, or would like a determination to ensure you can import one, contact the Weapons Policy section of Customs and/or the Firearms Registry of the relevant police force. In summary, if you carry a PLB and/or VHF to summon external assistance in an emergency, you should also seriously consider ‘the final mile’ i.e. how are you going to guide the resulting search aircraft or vessel to your precise location, even if the rescuers are looking in the right general area? Rescue lasers are of course not the only device available for this. ‘Traditional’ pyrotechnic flares, sea dye, strobes, headtorches, V sheets, rescue streamers and divers’ safety sausages all have their place. But in my view, rescue lasers offer so many advantages, particularly in size, weight, signalling duration and safety, over other distress signals that they should be seriously considered as part of any paddler’s essential safety kit. I remember Stuart Trueman’s comment about preparing for kayaking expeditions: if you made it to the start of your trip this was probably the most important moment of the expedition! That’s because inevitably there are many obstacles to overcome before a single paddle stroke is taken. When I decided in late 2009 to cross Bass Strait I had no idea of the obstacles I had to jump, bump and trip on before landing at Little Musselroe Bay, Tasmania on the 25th February 2011. Before making my first paddle stroke on the famous Bass Strait I had to contend with a smashed and destroyed kayak, a few shoulder dislocations, helicopter rescues, surgery, a rare nerve syndrome that claimed the use of two fingers and one false start! As they say, what doesn’t kill you just makes you stronger. Do I paddle today? I faced many challenges kayaking Bass Strait, but this was probably the toughest and the most rewarding. Making that decision each morning, with no paddling buddy to talk it through with, share the risk, or back me up. Each morning the decision rested on me and I had to face the consequences alone. Despite all the BOM weather predictions, the different weather scenarios, wind forecasts, sea states and tidal predictions, weather was never a sure thing. Most times the BOM was spot on, but some days the weather just did its own thing or just changed in an instant. There was always a risk relying on a weather forecast and every day I had to take the gamble alone: Do I paddle today? Perfect weather had accompanied Dad and I on our drive to my departure point at Port Welshpool, Victoria in December 2010. The night before the start, it was excitement that first kept me from sleep then it was lightning, rain and a howling westerly. Then anxiety hit me, my heart was beating so fast I felt like it was trying to escape my chest. The build up to this moment – the accident, surgery, difficult recovery, nerve damage, training paddles, planning and organising equipment – had all fallen on this moment, the anxiety was about as intense as I’ve ever felt. Do I paddle today? I checked the weather forecast. No. It seemed that the good weather window had closed, so I made the call to abandon this attempt to cross Bass Strait. Dad was amazing; he just said this wasn’t the time so we drove back to Sydney without complaint. The experience was invaluable as I went home and contemplated how I felt. With hindsight my little ‘stress rehearsal’ was a real advantage in preparing me mentally for the trip. In February 2011, we were back at Port Welshpool. This time the weather was perfect, even the tides were lining up well for a comfortable paddle down the eastern side of Wilsons Promontory. Dad watched in amazement as I somehow loaded a mountain of gear and food into my tiny Mirage 530. The last time dad had seen me in a kayak was when I was 12 years old, and now he was about to watch me paddle off to Tasmania. I knew the courage that must have taken for him, so I tried to not whimper when I realised I had accidentally deleted all my waypoints and tracks after switching on my GPS. With a blank GPS screen, I just pointed my kayak in the direction of Tasmania, waved goodbye and off I went to the stunning Refuge Bay. The consequence of nerves, a heavy kayak and a strong westerly got to me about 10km from shore, a pain in the right wrist probably from gripping the paddle too hard. My first case of tendinitis, it became just another thing I needed to manage and accept as part of the adventure. Day 2 was to start from the pristine and deserted Refuge Cove. Do I paddle today? was answered by a strong south-westerly, which convinced me to stay and explore for three nights. This gave me time to walk to Tidal River, get some Ibuprofen for my wrist, and take in the beauty of the Prom. On Day 4 the winds had blown over and it was time to take a leap of faith. I had to take my first hop off the mainland and cross 55km of exposed ocean to Hogan Island, a small grassy lump that you can’t see until you are well and truly committed. Despite the calm conditions, it took all my courage to keep the kayak pointing out to sea and battle the natural urge to turn back to the mainland. Hogan Island turned out to be one of the highlights of my trip. In a small worn hut built by the Flinders Island cattle graziers, I discovered a 20 year-old logbook. 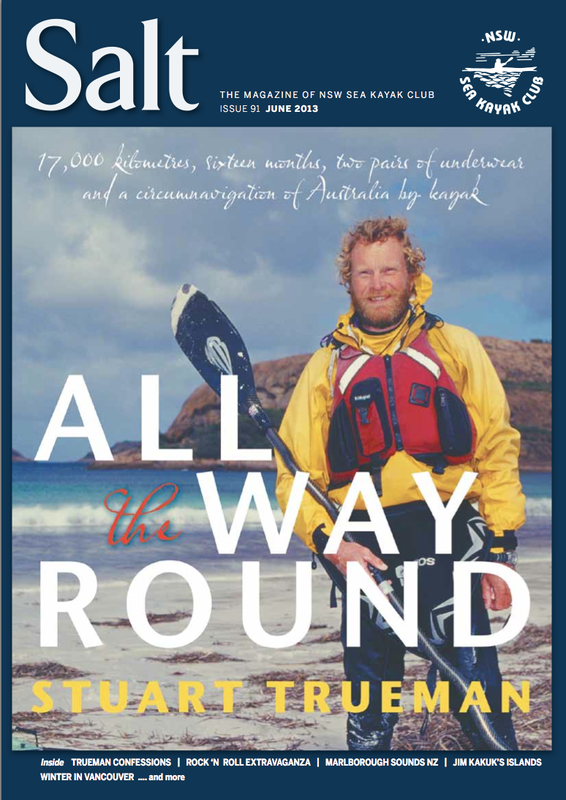 It contained the entries of those who came before me, including one by fellow kayakers Matt Bezzina and Mark Schroeder. They had left a little hello note to me a year earlier, it was a great and proud moment to finally be reading it. Since the trip, many people have asked me if I got lonely or bored during those nineteen days alone. Honestly, I don’t think I ever got lonely, but on some of those crossings I felt quite alone. The feeling of isolation really hit me on Day 5 crossing from Hogan Island to Winter Cove on Deal Island. Paddling into Hogan I had experienced my first little ‘white knuckle’ challenge with a small tidal race caused by strong currents surging between the twin islets just north of the main island. There was nothing like a bit of self-preservation to keep boredom at bay. Now getting into Winter Cove on Deal Island, even though I had a lot of faith in my Mirage 530, I was perfectly aware of what a nasty shore dump could do to a fully-loaded kayak. A year ago I had watched the demise of my previous Mirage 530, repeatedly crunched to destruction at the base of a cliff. I tried catching a smaller wave to get through the dump zone. This worked until it died out a little too early. I heard the surge of a rising wave behind, sucking me backwards. In my next attempt, I just closed my eyes and edged the kayak. After the initial thump, I went sliding sideways up the beach. I came to a stop, covered in sand, relief. I was tired and Winter Cove was misty and dark. I looked back at the angry surf. Whilst it was there, I would be stuck here. I ate and crawled into my sleeping bag feeling a little drained. The next morning I poked my head out of the tent. I was now looking at an island paradise! How could this be the same cove? Amazing what a good rest, food, sunshine and a change in swell can do! Now only a tiny wave broke on the beautiful beach of Winter Cove. Do I paddle today? Not when there was Deal Island to explore! A great decision as it turned out, as it was not long before a strong SW began to blow. For the next two days I discovered more coves and the Deal Island museum. I also met some of the locals, Cape Barren Geese, Bennett’s Wallabies and the caretakers, New Yorkers Tim and Lyne. They were kind enough to invite me into their cottage for a lovely warm cuppa and to re-charge the 50w external battery which was powering my mobile phone. The challenge presented itself when I realised that the tides for my crossing from Deal to Flinders Island were going to be particularly strong. They would be steaming around the northwestern edge of Flinders Island as I approached, potentially creating some challenging conditions. I needed to aim well north as I approached Flinders to compensate for the strong flooding tide that would drag me south and past Flinders if I didn’t plan for it. The morning of the crossing dawned. The pre-dawn starts were always tough, and this was no different: it was dark, the wind was still blowing from the southwest as it had been for the past two days and I definitely didn’t want it on this crossing. The wind forecast was for 5 to15 knots from the northeast, I needed this for the paddle, as the wind with the tide would be manageable. It was then that my Do I paddle today? was again tested. I couldn’t really see what the ocean was like until some distance away from land. I counted on the accuracy of the forecast, which up to this point had been pretty spot on, but would it hold? As I started to paddle, I started to doubt my decision. It’s difficult not to have thoughts of turning around. A wrong decision could stuff the whole trip. These Do I? or Don’t I? paddle decisions were the stand-out moments of my adventure. It really focuses the mind and adds a depth of clarity rarely felt in daily life. I suppose that was what added to the adventure and sense of achievement of doing this on my own. I had to focus on crossing the longest of the eastern Bass Strait crossings to Flinders Island. Thankfully a few kilometres from Deal things began to settle and it was looking like a beautiful day to do the crossing. On final approach, I stuck to my plan to be well north of Craggy Rock. 10km from Killicrankie Harbour, the normal landing spot for Flinders Island, the flood tide was in full swing. The wind was 15 knots from the northeast. Everything was in my favour so I decided to continue south around Cape Franklin and head for a tiny beach on Roydon Island, a small island which sits about 2km west of Flinders. After ten hours and 73km I got out of my kayak and watched the sunset. I finally relaxed for the first time since leaving Port Welshpool and celebrated with the remains of my red wine. After spending two nights on Roydon Island I decided to continue south and spend the night at Emita, about half way down the west coast of Flinders. But I didn’t get very far. The forecasted 15 to 20 knot NE turned out to be a 27 knot gusting to 40 NE. I didn’t realise this until after paddling as hard as I could, giving up 4km and an hour and a half later. I had made it across to Flinders Island to the northern end of Marshall Bay and pulled into a little beach just past Bun Beetons Point. A lady who had watched me struggle around the point invited me up for a tea break. Well, coffee turned into a lunch of champagne and fine food, which turned into a beautiful dinner of local wallaby with friendly locals. Finally on Flinders Island, I ended up spending seven days there due to the weather. All but one of those days the wind blew hard. My forced stay was an unexpected joy, my stay on Flinders became all about the friendly and interesting people I met and included a tour of the island by both land and air. The following day I took advantage of a lull in the weather and headed for Trousers Point, about a 45km paddle. I needed to make the most of it as strong SW winds were forecasted for the following three days. Along the way I experienced more sea fog. However as I approached the final 10km the fog started to lift exposing small glimpses of Mt Strzelecki. After a tiring day I rounded the corner into the small bay on the southern side of Trousers Point, it was calm and golden now with an impressive mountain backdrop. Making camp, a very strong and sudden wind from the SW began blowing straight into the bay and didn’t stop blowing for four days. I tied my kayak to some wooded stairs where I dug it out four days later. The next day I hitched a ride into Whitemark with Wayne, a local field officer for the Tasmania Parks and Wildlife Service. Tagging along on his rounds, I got a tour of the island, visiting all parts including Killicrankie and the east side of the island. After a brief stop at the hospital to have an open wound on my lower back checked, and a celebratory beer at the Whitemark pub, I met some more friendly locals, Lois, owner of the general store, and Leedham Walker who turned out to be a very interesting and lovely third generation islander. After a windy and wet night in the tent, the lovely Leedham tracked me down the next day and invited me to stay with him and his wife Judy. I was supposed to be roughing it, suffering in the wilds of the fierce Bass Strait. Instead I was enjoying warm showers and home cooked meals, ah the benefits of solo travelling: adapt and survive, I say. Just when I thought it couldn’t get any better, Leedham showed me his Cessna and then took me for a spin over the island. We flew out of Whitemark and headed south to take a look at my route to come, via Cape Barren and Clarke Islands. On the way south we flew over Trousers point to check on my kayak, I was relieved it hadn’t blown away. My last afternoon was spent climbing the 750m high Mount Strzelecki gazing down at the spectacular views. I started making my way further south towards Banks Strait, the final crossing to Little Musselroe Bay on mainland Tasmania. Leaving Flinders Island for Cape Barren Island turned out to be another of those Do I paddle today? moments. The conditions weren’t great but good enough to take on the 15km across Franklin Sound. After a brief stop at the Cape Barren township I headed off for Thunder and Lightning Bay, my proposed camp on the southern side of the island. After setting off the winds built up to over 20 knots which made me a little nervous but I knew I would be off the water in less than two hours so I didn’t worry too much, until I approached the cape. Before I really knew it, I found myself right on top of a shallow reef with exposed rocks and standing waves. I had made a ‘school girl error’ with my casual departure and I hadn’t bothered to check the tides. The tide was streaming towards the east and the wind blowing in from the west and there was a nasty reef under me. This was my ‘whitest knuckle moment’ of the trip, a twenty minute ordeal which really tested me. After all my planning for the big crossings ironically it was this moment that almost had me. I felt alone and isolated and remember visualising my roll in anticipation of capsizing. I’ve never been more focused and in the moment. Fortunately the breaking waves were not as powerful as they looked and I reached safety when I rounded the corner into the quiet lee of Thunder and Lightning Bay. It was a definite ‘kiss the ground’ moment when I landed. It felt like my life had been enriched by the intensity of the moment, it was like someone had turned up my sensation dial as I absorbed the beauty of the late afternoon. My last three days between Thunder and Lightning Bay on Cape Barren Island and Spike Cove on Clarke Island were beautiful. The forecast for the next few days was for light winds and sunny skies so I felt confident that I would have a clean run into Little Musselroe Bay. Heading for Clarke Island, I first pulled into Preservation Island for the afternoon. Thanks to the calm weather, it was straight out of a holiday brochure: beautiful clear water with white sandy bays surrounded by the characteristic bright orange tinged boulders. My next stop was Spike Cove on Clarke Island. There I found a small little beach tucked away on the far end of the cove. I found space for about one tent, a protected little spot where I enjoyed my final two nights in Bass Strait. Crossing Banks Strait on Day 19 was the final challenge. Throughout my trip I was able to get the weather forecast from the Bureau of Meteorology (BOM) using my smart phone, via the Telstra 3G reception. Sometimes, after landing, I had to hunt for reception, but I was able to pick up something at all stops along the way. This made the crossing easier than having to rely on set radio announcements. Ultimately my world was reduced to caring about two things: getting weather information and making decisions about when to paddle. Although the shortest of all, I took this final crossing pretty seriously because the tidal streams here are stronger than elsewhere along the whole route. At their peak, beyond the speed at which I can paddle. I had the usual nerves when I woke up early, but I was feeling good. I set off towards Lookout Head where I would make my dash across the strait to Little Musselroe. As I paddled away from the lee of the island I started to see a line of white water a few 100m ahead of me. The wind pushing against the outgoing tide causing the sea to rise up and form white caps and confused conditions. I’ve never seen the sea quite like this. From calm to rough – it was that quick. Days previously I learnt that it can look worse than it is. Ultimately the only way I would know how rough it really was would be to charge on in. Thoughts of turning back punctuated my mind but I was committed. The defining moment came when, amongst the leaping breaking waves, a little penguin popped up beside me. It appeared to be having a ball and enjoying the bouncy conditions. Hey, I thought, I should be having fun also! As soon as I began to relax, everything became a lot easier. Some hours later I began to make out the distinct shape of Swan Island and behind it my final destination and, hopefully, my dad with a big welcome. I paddled into the inlet at Little Musselroe eagerly looking across the shore for him. I recognised my van parked not far from the water, but where was dad? Confused I semi-ceremoniously made the trip’s final paddle strokes and pulled up on shore. I walked up to the car but still no one. Not quite the reception I had in mind. A guy on a tractor appeared. “Ah, you must be that chick paddling across the strait. Your dad’s waiting for you up on the headland.” With the mystery solved, I walked up to my dad as he sat anxiously looking out to sea. A direct crossing from where I left from Clarke Island would logically have me come in on the west side of Swan Island, not the east, and this was the direction my father was keenly observing. “Cripes,” he shot up, “where’d you come from?” We posed for a well-earned team hug. A fitting ending for my solo journey that was less about fleeting glory, and all about inner discovery and the experience of real adventure. Solo adventures are hardly ever achieved solo. My trip critically involved the advice, support and encouragement of key friends and family. I especially would like to thank Andrew Eddy for the in-depth discussions about the route, the weather and the tidal streams. I was also grateful for Andrew’s advice and support during the crossing. Rob Mercer was a very supportive inspirer and another valued source of advice. I also thank Rob for providing the many opportunities, from which so many of us in the club have benefitted, to improve our skills and experiences on the ocean. Ian and Dave at Mirage were wonderful at providing me with my custom Mirage 530. And thanks to Bettina Otterbeck for bravely taking on my journal. I had a bumpy ride the year leading up to the crossing, with various setbacks and challenges. It all made me realise how valuable those around me are, friends like Rae, Neil, John, Guy, Paul and to my wise friend Pax who showed me the way; thank you. Thanks to the friendly people on Flinders Island, especially Leedham and Judy Walker, Allen and Louise and Frank and Joy, Karen and the Box Thorn crew, who all made my Flinders experience a very memorable one. And ultimately to the guy and gal who I know endured restless nights and premature ageing: my wonderful mum and dad, thank you so much. Recently, while involved in five days of some solid paddling activity, I had the opportunity to do some field testing on the Helinox Chair One. The Chair One is manufactured in Korea by Donagh Aluminium Company (better known as DAC), an organisation that specialises in making lightweight outdoor adventure equipment. DAC enjoys a world-wide reputation for the high quality of the materials it uses in its products which include tent poles and trekking poles. The Chair One is the result of three years of development. It’s well designed: simple yet highly functional. There are only two components, the frame and the seat cover. They are easy to put together (the frame almost self-assembles), even in the dark. The printed instructions that come with the chair are almost superfluous. It’s well made: the slim-tubed frame is made of a high-quality, light-weight anodised aluminium alloy (or, to be accurate, TH72M – an alloy said to have an unrivalled strength­to-weight ratio). The frame is held together with shock cord – thin but durable. The seat cover is a combination of meshed fabric and a plasticised cloth. The stitching is robust as are the pockets into which the frame fits when the chair is assembled. The finish of both components is clean – no loose threads sticking out from the seat cover. The carry case reflects similar quality. It’s strong: the product specifications indicate that the chair can cope with a 145kg person sitting in it. Not many sea kayakers tip the scales to this extent. The chair showed no ill effects from me frequently plonking my 85kg body into it. It’s light: Chair One weighs close to 940 grams when packed in its carry case. This is a significant weight saving on the three-legged stool I’ve been using up until now. It’s compact: when disassembled and packed snugly in its carry case, Chair One measures 35 cm long X 10 cm wide X 12 cm high (not much bigger than one of my sandals). When assembled, it measures 52 cm wide X 50 cm deep X 65 cm high. During a rain shower while field testing I was able to use the chair inside the vestibule of a 3-person tent with headroom to spare. It’s comfortable: promoted as being “lounge-chair” comfortable, I reckon I could nod off in Chair One without too much difficulty (which is something I wouldn’t want to do on my 3-legged stool). One of the best features about the chair from my point of view is that it’s very easy from which to prepare a camp meal. 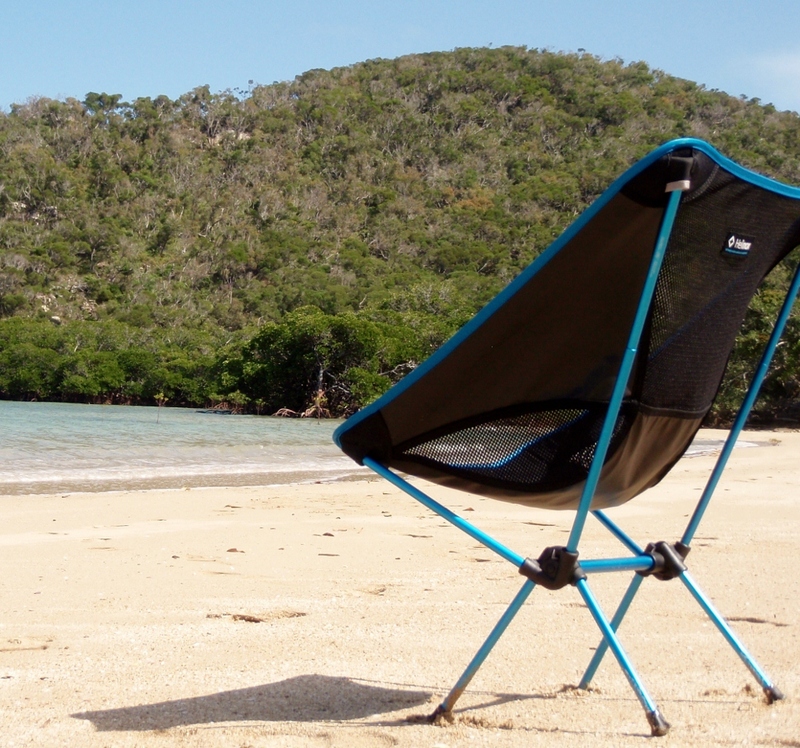 It’s practical: I sat in Chair One on various surfaces – from sandy beaches to riparian campsites. The legs of the chair are angled enough to avoid too much sinking into soft surfaces. Its scalloped rubber boots also assist in this regard. I sat in the chair in my wet paddling kit a couple of times without any apparent ill effect. I really can’t say that I found any negative aspects of Chair One during my field test. The one occasion when I tipped over backwards getting into the chair was caused by my own carelessness. Being lower than most camping chairs, heavier folk might find it more difficult to get up from. I think the sub-title of this review says enough. It was a cool autumn morning when we gathered at the Fingal Bay holiday park campsite kitchen. We squeezed into a small communal room. Beanies and jackets indicated the current temperature. The much anticipated Grade 3 Weekend had arrived. A registration system was set up, and then it was either a short trolley or drive down to the launch zone. I was in the Saturday morning surf session with sea instructor Nick Gill. The air temperature warmed a bit, however we all dressed sensibly with layers and a cag as getting wet was more than inevitable. Helmets were the choice of headwear and many of us also had a tethered nose plug. At the briefing we discussed our goals with Nick. Maintaining a straight line seemed to be a common objective, survival another. After a few waves Nick summoned us together for an on-land review and discussion of technique. Nick paddled out and then provided an on-wave demonstration of edging and stern rudder use. He confessed it was a bit exaggerated however often demonstrations need to be. I experienced a few combat rolls, including one on the first wave I caught. There is nothing quite like the tactile reminder of insufficient or wrong edge as you take a dip. Nick explained and demonstrated backwards surfing. Encouraged by this I had a go and managed a long backwards ride though I was not doing any intentional steering. The cranking around of our sea kayaks with static sweep strokes gave a good torso workout. The unscheduled capsizes provided opportunity to practice rolling setups in surf that required waiting for the right moment to roll up. I’d seen the prior surfer get off a wave near shore and start to paddle parallel to the shore line and further to my right. I surfed in on a wave, experimenting with paddle placement in the froth and somehow turned my kayak ninety degrees from the direction that I was travelling in. This put the other kayaker into my view. “No matter, she is some distance away and paddling out,” I thought. My computation did not take account of my surfing speed versus her lack of speed punching out through the surf zone. I realised that I was on a collision course too late and glanced the other kayak. Upon review, I realised it would have been better for me to have capsized. It would have reduced my speed and thus the potential to injure a fellow paddling pal and cause damage to her kayak. As the water was deep enough capsizing was a safe option. The actual cases of capsize that I knew of were when the sitting duck capsized to avoid a surfing kayak, however I had not thought about it the other way. Throughout the session I had been actively maintaining an awareness of the triangle of death [see footnote below] so I was mortified at being the cause of this collision even though it did not have a big physical impact. Nick later suggested that deliberate capsize of both kayaks was another good option. I came away with much greater confidence in my ability to roll in surf, a little more sea kayak surf control and a tad wiser. The triangle of death is a 90 degree triangle which operates when surfing towards the shore. The shoreline is one line and the other two are at 45 degrees to the left and right of your intended straight line course to the shore. Assume on take-off that your sea kayak can hit anything or anyone within this triangle. For those of you who wondered why Mike Eggleton didn’t run his forward stroke clinic at Rock ‘n’ Roll this year, it was because he and Shirley have retired, sold the house and moved to the Sunshine coast, taking their surf skis, kayaks and a beautifully converted camping van. They may have retired but you can be sure they’ll be busy with the grandchildren, paddling and extended holidays. Like many of us Mike was captivated by our sport of sea kayaking, and his determination to ‘get it right’ led to hours watching the kayak roll video and many more hours upside down in his kayak. With the elusive roll mastered he moved on to perfecting the forward stroke and has become one of the club’s best advocates and coaches of the forward stoke. His knowledge of the sport was extended when he worked for NSW Canoeing. He understands. and has impressed on others, the risks involved in the sport and the need to be well prepared. As the club grew in numbers Mike realised that our sea instructors were over-taxed so he worked with Rob Mercer to develop the role of flat water instructor within the club. Thus our basic skills program and grading system evolved. He gained instructor and assessor qualifications, mentoring and assessing most of our flat water instructors. I first met Mike when I did basic skills. It was the middle of winter and he was assisting Dee and Kate to get their flat water instructing qualifications. “Does that paddle work well for you?” was the first of his loaded questions that I fell for before he explained that I had the paddle upside down. Now four years later it was me being assessed as a flat water instructor and guide by Mike and I knew I’d need to be on my game. Sure enough, a couple of the punters had their paddles upside down as we left Clontarf. Next, Bettina fell out of her kayak right where the current would wash her onto a Spit Bridge Pylon and Neil had been instructed to ignore me and wander off if I asked the rest of the group to raft up safely during the rescue. Mike’s a perfectionist so he sets the bar high, no-one gets away with sloppy presentation or poor skills and we’re all very grateful for his perseverance. That perfectionism extends to his equipment; if you take a look at one of his many kayaks you’ll see that they’re in immaculate condition. He designs and fits his own sails and has also helped many of his mates with installing sails, pumps and other modifications. I was also lucky enough to spend time with Mike at Narrabeen Lake working on my forward stoke. If you think you’ve got a good forward stroke, try paddling a K1… “Don’t slouch, vertical paddle, are you going to let him get away from you?” The Saturday sessions were a demanding workout, lots of fun and always followed by a coffee and chat. In support of Charlie Teo’s work, Mike and Shirley initiated and run the annual Myall Classic Marathon to raise money for the “Cure for Life Foundation”. Don’t be fooled, it’s rarely a flat water event as the weather often turns on severe conditions. It’s a fantastic warm-up for the Hawkesbury Canoe Classic and has raised thousands of dollars. Just another example of Mike’s generosity as a volunteer. NSW Sea Kayak Club would like to wish Mike and Shirley Eggleton all the best. Mike has been an active and highly valued member of our club for many years and will be sorely missed. We set out early one Saturday morning at the end of April, Stephan Meyn, John Friedman and I. Stephan and John are both kayakers with 10+ year’s experience. I’m a newbie, a grade 1 who joined the club 6 months ago. When Stephan posted the trip on the club web site, I thought ‘That sounds like fun’ and ‘If not now, when?’ I have done a fair bit of bush-walking and cycle-touring. I had done one overnight trip in my kayak, from Berowra Waters Ferry to Marramarra National Park and back. The furthest I had paddled was about 20km in a morning, so paddling 30 or 40km a day sounded doable; demanding perhaps, but doable. We drove 800km on the Saturday, arriving at a caravan park in Moama after dark. The next morning we were up early. Stephan assembled his folding kayak in an hour and a quarter. We took our kayaks down the river embankment to a nearby pontoon, and loaded them there. Then Stephan and I drove the 90km to Barham, left a car there, and drove the other one back to Moama. By 1pm we were ready to slide our heavily laden kayaks off the pontoon and into the water. There is plenty of water and the river is glorious. People tell us that three weeks ago the river was three metres higher, and spectacular. We quickly pass Echuca wharf. In the 1870s and 1880s Echuca was the second biggest port in Australia, until the construction of roads and rail brought more efficient ways of transporting people and goods. Today there are paddle boats aplenty, taking tourists on trips up and down the river. Paddle boats, houseboats and holiday cabins line the banks; the boats on the water and the cabins at the top of the embankments. The current gives us a nudge along. Occasionally the wind presses against us. Cabins give way to homes on bigger blocks. Eventually there are fewer buildings, fewer houseboats, and the odd skier. About 3pm we pull up to an embankment where it looks like we might be able to make camp. As it happens the campsite is right next to a moored three level houseboat mega-mansion. The person who is looking after the boat is dwarfed by it. She has her four wheel drive and jet ski parked next to the campsite. If we face upriver we don’t have to look at the boat. The landscape is glorious in the late afternoon sun. We pitch our tents, collect firewood, and start a fire. We make our dinners. And we sit and talk around the fire for hours. There is something fundamental and primeval in sitting on the ground around a fire, with the overarching sky above, vast and awash with stars. We are aware that people have been doing this for millennia. The weather was pretty kind to us. Some days we had maxima in the low twenties; some days it was 15 or 16 degrees. The evenings got cold, getting down as low as 2.5 degrees. Good sleeping bags, and in my case a hot water bottle, helped. Paddling down the river was comfortable most of the time, with our expended energy warming us. As soon as we stopped paddling, we were cold. When we stopped for morning tea or lunch, we would throw on a jacket, or light a campfire and squat around it warming ourselves. In the evenings we would start a fire as soon as we landed, changing out of wet gear and pitching tents before we lost the light. And in the mornings when we rose, we would rekindle the fire. When we wake there is a miasma on the water, shafts of morning sunlight pushing through it as it dances across the surface. The magpies warble and the kookaburras laugh to wake us. All around there are red gums, and sometimes box gums. On the second day, thinking my set up is not quite right, I adjust my pedals closer to me. Somehow I manage to bring my right pedal two stops forward. Suddenly getting full extension of my right leg is really hard work. What has happened? Is my right leg longer than my left? Eventually I work it out, and adjust the pedal back, but not before I have worn a big nasty bruise on my right buttock. The next evening, I get my first aid kit out, and John patches me up. John and Stephan are technological titans, so morning and evening, the tablet computers come out and emails are sent, weather reports checked, and tweets tweeted. A photo is taken, and by next morning my bruised buttock has gone viral. Entry by toes/ spear the fish! As I paddled along I worked my way through the mantras over and over, trying to string them together into a relaxed flowing and efficient stroke. I was in my Mirage 580. John was paddling a heavier 580 than me, carried an extra 10kg or so of water, plus copious supplies of out-of-date jars of fruit and muesli bars. Stephan paddled his Feathercraft folding kayak, an inherently slower kayak. Both of them powered on effortlessly, looking as though they could go on forever. They would regularly look back to check on me, and every couple of bends would wait until I caught up. I can see that with a comfortable forward stroke, paddling down a river could become quite meditative. It’s a journey, and the journey is the thing. Paddling moves back and forth. It’s a series of practices. I push along at a slow rate. One day John comments to me that with the rhythm of the stroke he found himself falling asleep as he paddled. The landscape on this section of the Murray varies subtly from moment to moment and day to day. The river winds and winds back on itself. The banks are steep and muddy; sometimes steeper, sometimes less steep; sometimes very muddy, sometimes a bit dryer. The first couple of days the Murray River Red Gums are big and gnarled, and their roots hang out of the river banks, and every so often there is one fallen in the river, creating snags and a reef for the fish of the river. In the middle couple of days there are sometimes willows lining the banks. And as we go further down river the Murray River Red Gums are smaller and gnarled, and their roots hang out of the river banks, and every so often there is one fallen in the river, creating snags and a reef for the fish of the river. I’m glad I have my forward stroke to work on. I think otherwise paddling this section of the river might be like vipassana meditation. One day, as we are stopped on the side of the river, squatting around a warming fire, having our lunch, we are passed by three kayakers. Two of them are in a double, and they fly on down the river. The third one, a woman in her sixties, sees us, turns back, paddles over and stops for a chat. They are from Melbourne. They are paddling the whole river, from source to sea, taking 40 days and averaging 55km a day. Remarkable, but perhaps not a quiet meditation. On the third day we pull out the stops and keep paddling until we reach Torrumbarry Weir. The weir is at full capacity at the moment. Rain is forecast for the coming night. There is a caravan park at the weir, the one settlement we encounter along the river. We book in to a flash cabin, eat a great dinner, and sleep warm all night. In the morning we go through the lock. We paddle through the gates on the upriver side, sit in our kayaks as the water level drops 6 metres, and paddle out the gates on the downriver side into the fast flow running from the base of the weir. Torrumbarry Weir marks our halfway point. The second half of the trip passes through state forests. On the NSW side are Perricoota Forest and Koondrook Forest. On the Victorian side is Gunbower Island. Apart from the occasional campsite there is little sign of human activity. As I paddle along I keep getting pain in the lower back. I find myself having to stretch out over the back deck every fifteen minutes or so to shake things up, so that I can keep paddling. On the fourth day, it’s particularly hard going, and I feel my energy flagging. I’m going slower and slower. Stephan and John see that I’m struggling, and find a place for us to pitch camp for the night. I’m cold and tired. John gets the fire going. We get our tents up, and make dinner. John and Stephan discuss contingency plans. They start thinking about what we will do if I don’t have the energy to keep going for the next two days. We are passing through state forests on both sides of the river. The first signs of habitation won’t come until just before Barham, some 70 km away. It’s about 6pm. It’s dark. We are making our dinners. I have cooked myself some pasta and pesto. I like to use a sharp knife when I cook. I have brought a cutting board too, but this time I don’t use it. I take the block of parmesan and try to cut a slice into my bowl of pasta. The knife skips off the parmesan, and instead I put a fillet of finger in the pasta. Blood pumps. I grab my finger and hold it tight. Out come the first aid kits. Stephan wraps the wound in an absorptive dressing, and binds it up with duct tape. I’m enrolled in Bruce McNaughton’s coming first aid courses. I wish I had done them already. Somehow I sleep that night. The next day, I adjust my pedals out one stop, and then another. The back pain eases off a bit. I have my energy back. We paddle 38km. The following night my finger is throbbing. I don’t realise that I should elevate it. I lie awake most of the night. The next day we paddle the final 29km to Barham, pull into the caravan park, unload the kayaks, and carry gear and kayaks up to our cabin. The kayaks are smeared with mud inside and out. We start cleaning them. I drop from a half-squat and my knee lands on my injured finger, eliciting a cry of anguish. I was planning to find a doctor once we got to Barham. Now seems like a good time. Stephan drives me to Barham’s hospital, which is about a kilometre from the caravan park. We are welcomed in by the nurses, and they start working on me straight away. They take off the duct tape dressing and with compression try to stop the flow of blood. That doesn’t work, so they call the doctor. He comes from his home, anaesthetises my finger, gets me to wash the wound, and then inserts a stitch through the nail. The nurse dresses the wound, and off we go. I’m feeling a little in shock, but it passes. We pick up John and have a decent meal in a pub in town. The next morning, Stephan folds up his kayak. We load all our gear into the car, and drive back to Echuca. Echuca is a town that is forging a tourist trade based on the river and the town’s historical roots. There are cafes, heritage buildings, wine vendors, tour operators, bakeries, restaurants and boutiques. We have coffee and walk around the town. Then we pick up the other car in Moama, and start the 800km drive back to Sydney. We have travelled 190km over six days. I have made some improvement in my forward stroke. I’ll keep working on it (and yes, I still welcome advice!) I will get advice on my cockpit setup, and somewhere in the mix will get rid of the back pain. My favourite times on the trip were when we were sitting around the fire in the evening. Sometimes we would talk, sometimes sit in silence, enjoying the stillness of the night. I had the fortune to be travelling with John and Stephan, who looked after me well, kept encouraging me when I was struggling, and waited for me on the bends. On top of that, they are intelligent people with stories to tell, so discussions ranged far and wide across all sorts of interesting topics. What a delight!